One of the main definitions of “smart” is doing things “right,” while one of the main definitions of “stupid” is doing things “wrong.” Again, like so many expressions of personal disapproval, the accusation of “wrongness” can be very powerful, so much so that it can stop you from taking a risk on new and untried (but possibly better) ideas. However, you can respond to this problem very effectively, simply by embracing stupidity. By not engaging in a knee-jerk avoidance of stupidity/”wrongness” labeling, a much larger range of options will open up to you. To see how this works in real life, let’s suppose you want to get a job doing something really fun, like being a rock star. To do this the “right” way, there are schools where you can go to take lessons and classes. You could easily get a bachelor’s degree, or even get a master’s degree and a Ph.D., in rock and roll-ology. There are lots of people who will create a syllabus for you and, after you have paid your tuition, they will sign papers saying you have all the necessary qualifications to do the job. It all sounds great of course, but no matter how well you do on your final exams, there is absolutely no guarantee that you will ever get a single gig, or even have a chance to perform anywhere. Conversely, if you have no schooling at all, it is still quite possible to go to the top of the charts. Some of the most famous musicians in the world never went to music school. Some of them can’t even read music. Clearly, this is the “wrong” way to go about it, and yet, very often, it still seems to work. Steven Spielberg is a marvelous example of not following correct procedure. He was not accepted to film school, due to his C grade average in high school. His “procedure” for getting into the movie business involved making a connection to someone on staff at Universal Studios. He sneaked past the security guards every day and basically just hung around and got to know everybody, learning production skills from the pro’s. After a while, he started to get assignments. Four years later, when his peer group was about to graduate from film school, hoping to get jobs as gophers on a real movie set, he was already directing network television shows. This was hardly a proper or correct procedure, but it worked magnificently. 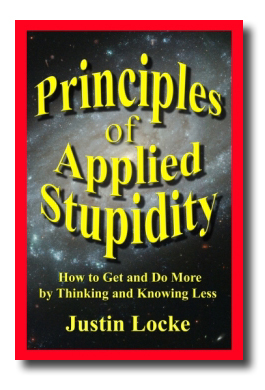 While there is of course no one simple “trick” to getting a plum job, there are a number of ways that the Principles of Applied Stupidity can be an enormous help. First of all, it is important to get past one of the most cherished tenets of smartist culture, which is that, if you conform to and follow “procedure,” you will succeed. Yes, if you follow procedure, you can probably succeed at getting a job frying hamburgers, but getting a position that is a little more profitable and unusual, well, not so true. Many hundreds of thousands of people seek careers in music performance or art history. They carefully follow all the rules and procedures, the get all the degrees and certifications, and yet they still fail to get a job in those fields. When the failure comes, most of these people assume that they failed because they did not follow the procedures carefully enough, when in fact the opposite is usually the case. Procedures proudly offer themselves as safe gateways to success, but most of the time, following procedure actually leads to failure. They Are Designed to Get Rid of Them. 4) There is usually someone on the other side of a procedure (i.e., a person who is looking for one person out of a thousand applicants) who wants to avoid going through all of the many dull steps of the procedure if they can. When talking about seeking a plum job, following procedure is not only not very helpful, it can actually be counter to the success you seek. Therefore it is best make yourself as unaware of “proper procedure” as possible. If you follow procedure in a highly competitive environment, statistics are not on your side. The most likely thing to happen is that you will be rejected, as the whole point of procedure is to winnow people out. The person who is supervising the procedure is usually eager to get the whole thing over with, and will reject you on the slightest pretext. However, if you ignore procedure, right off the bat you have made yourself stand out from the crowd. Yes, you are doing something “stupid,” as you are demonstrating a total lack of knowledge of how things are supposed to be done. However, in doing so you have drawn special attention to yourself, possibly from a person with real power and not just a lower level bureaucratic gatekeeper. This gives you a very good shot at beating the entire pack, as you are giving the person in charge a quick, simple, and easy solution to their problem. A live person who has barged in will always be victorious over a stack of 300 polite resumes. In fact, the more of these process-following competitors you have, the easier it is to beat them, as they make themselves cumulatively unappealing by their sheer volume and similarity. At the very least, if you must follow proper procedure, be the very last person to send in the form. That will put you on the top of the pile.